come with your choice of custom bases. All of our Glass and Acrylic Display Cases are available in custom sizes. We feature the webs widest variety of Displays for your Baseball - Football - Full Size & Mini Helmet - Hockey Puck & Stick, Basketball, Beanie Baby, Diecast Car, Doll and more. We specialize in Custom Display Cases. CLICK ON ANY IMAGE TO VIEW A LARGER IMAGE AND THE ITEM DESCRIPTION. Our best value for basic protection. 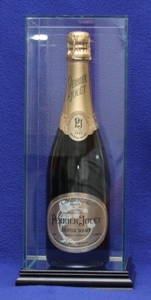 Injection molded acrylic display case for a single standard Champagne bottle. This case is available with a clear back, or mirrored back. The beveled edges are a nice change from the usual squared edges cases. We also make custom sizes. Just Ask! We are the only display case company that doesn't limit the amount of text you can have on your free nameplate - plaque. plate from a trophy shop could cost more than the display case itself. With us, its FREE!!! 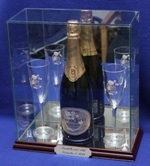 Single standard champagne bottle vertical acrylic display case featuring optically clear, UV protected acrylic with a black acrylic base. Includes 1 free nameplate. Interior dimensions are 5"L x 5"W x 13"H.
We also make custom sizes. MAGNUM 1.5 Liter - DOUBLE MAGNUM 3 Liter - Just Ask! Single magnum champagne bottle vertical acrylic display case featuring optically clear, UV protected acrylic with a black acrylic base. Includes 1 free nampelate. Interior dimensions are 6"L x 6"W x 16"H.
We also make custom sizes. DOUBLE MAGNUM 3 Liter - Just Ask! 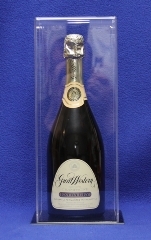 Double magnum champagne bottle vertical acrylic display case featuring optically clear, UV protected acrylic with a black acrylic base. Includes 1 free nampelate. Interior dimensions are 8"L x 8"W x 21"H.
We also make custom sizes. MAGNUM 1.5 Liter - Just Ask! frame and real UV protected glass. The back is mirrored so you can see the entire bottle. with a cherry or black finish. The floor is mirrored so you can see the entire bottle. Choice of clear or mirrored back. Interior dimensions are 5"L x 5"W x 13"H.
Includes 1 free nameplate. Engraving space is approx 6 x 1-1/4. The text that you type into the engraving fields will be laser etched directly onto the glass. engraved nameplate - plaque, please call or email us. wood base and real UV protected glass. The base is mirrored so you can see the entire bottle. Also includes a choice of a clear or mirrored back panel. of a clear or mirrored back panel. Interior dimensions are 5"L x 5"W x 13"H.
The text that you type into the engraving fields will be laser etched directly onto the glass. The location of the etching will be centered on the lower part of the front panel. If you would like the etching to be in a different location, or if you would like additional panels etched or a traditional engraved nameplate - plaque, please call or email us. Includes 1 free nameplate. Interior dimensions are 6"L x 6"W x 16"H.
Includes 1 free nameplate. Interior dimensions are 8"L x 8"W x 21"H.
with walnut finish custom hardwood base. Price includes 1 free nameplate. Additional nameplates are available. This is perfect to display an important wedding memory in a very special way. two ( 2 ) flutes - glasses. There is enough room to hold wider flute. in your choice of finishes. Also includes a choice of a clear or mirrored back panel. Includes 1 free nampelate. Interior dimensions are 11"L x 5"W x 13"H.
Our best value for basic protection. 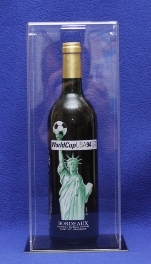 Injection molded acrylic display case for a single standard wine bottle. This case is available with a clear back, or mirrored back. Single standard wine bottle vertical acrylic display case featuring optically clear, UV protected acrylic with a black acrylic base. over. Includes 1 free nameplate. 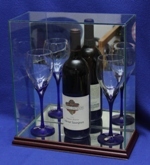 Interior dimensions are 15"L x 5-1/4"W x 5-3/4"H.
Single standard wine bottle horizontal glass display case featuring a furniture grade wood base and real UV protected glass. The base and back panel are mirrored so you can see the entire bottle. Comes with a custom cradle to hold the bottle up off the floor. If you want to keep the cork wet, you should display your bottle in this horizontal position. The cradle has custom supports to prevent the bottle from rolling. For larger/wider bottles, simply turn the cradle over. Interior dimensions are 15"L x 5-1/4"W x 5-3/4"H.
so you can see the entire bottle. Includes 1 free nameplate. 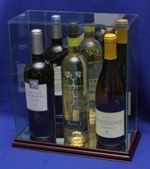 Interior dimensions are 5"L x 5"W x 13"H.
Vertical glass display case designed to hold up to three ( 3 ) standard wine bottles. so you can see the entire bottle. Includes 1 free nameplate. Interior dimensions are 11"L x 5"W x 13"H.
We also make custom sizes. If you want one for 2 bottles, 4 bottles or more, Just Ask! Single standard wine bottle vertical glass display case featuring a furniture grade wood base and real UV protected glass. The base is mirrored so you can see the entire bottle. Interior dimensions are 5"L x 5"W x 13"H.
two ( 2 ) glasses. There is enough room to hold wider glasses. We now offer Point of Purchase , POP store fixtures and display cabinets thru our commercial division. Our more than 20 years of fabrication experience, makes us the #1 choice for all your commercial display needs, including Store Fixture, Visual Communications & Commercial Casework. We ARE the manufacturer, so you save money by dealing direct. *Free nameplates include up to 3 lines of text on most case and up to 4 lines of text on certain cases. We try not to limit you on the # of character per line, but most cases can only hold a plate that can take approx 30-40 characters per line. If the text that you request is too many characters for that particular case, we will let you know, otherwise we will simply use a larger plate. If you need more lines of text than are offered on the item page, please call us and we will be happy to make you a custom size nameplate. An additional charge may apply. Due to the size of the cases, nameplates may not be included with some very small cases. Some cases only come with 1 nameplate due to the layout of the case. See individual items for additional info and/or restrictions. An additional fee may apply for custom fonts and special characters/symbols. **Does not apply to golf ball display cases. Copyright 2017 Crystal Caseworks, LLC - All Rights Reserved. Use these convenient Quick-Links to jump directly to the category that you want. Unauthorized use of the images on this site is prohibited. Items shown inside of the Display Cases are not included. displayed should be measured carefully before ordering. We are not responsible for typos on this website.